The following quick tests are assessed at the beginning of the objective examination and can be used as a reassessment measure. Each test involves multiple joints namely the sacroiliac, the hip, the knee, and the ankle joint. These tests are used to examine the functional ability of the patient and gives the examiner insight into the involvement of the pathology of the injured joint. Squat:1 The patient is asked to stand and perform a squat, lowering the body as far as the patient can tolerate. Active dorsiflexion is performed at the ankle with this maneuver and the therapist should observe to see that each joint motion is equal. If desired, this test can be progressed to a single leg squat as well as by adding a bouncing motion to the end of the squat. Single Leg Stance:1 The patient is asked to stand on the uninvolved and the involved lower extremity separately. Any excessive ankle instability differences across both joints should be noted. If desired, this test can be progressed by asking the patient to stand on the toes while standing on one limb. Active plantarflexion of the ankle is thus performed by the patient and any differences in range of motion, strength, and quality of movement in the lower extremities should be noted. The examiner should observe the patient’s normal gait pattern as the patient walks through the clinic into the examination room. This ensures that the patient has no idea that he or she is being watched and allows for an honest assessment of the motion. Any asymmetries or deviations from the normal gait cycle should be noted. In addition, any compensation(s) displayed by the patient should be observed as they provide clues to the underlying pathology of the patient. Observation of the ankle during the gait cycle should include the following: bony alignment of the calcaneus and talus compared to the tibia either displayed as hind foot varus or valgus and pronation and supination of the forefoot. Anterior view: In addition to the above mentioned observations, this view allows the physical therapist to assess muscle involvement (mainly the tibialis anterior) during postural sway at the ankle as well as assessment of the medial and lateral malleoli. Posterior view: Muscle atrophy or hypertrophy of the gastrocnemius can be assessed with this view. This is important to note as the muscle deformity could be the outcome of a peripheral nerve lesion, possible nerve root compression, or disuse of the muscle because of injury. In addition, the Achilles tendons are compared to check for any deviations. Again, the therapist compares the medial and lateral malleoli to insure for proper alignment – the lateral malleolus should be inferior to the medial malleolus. Finally, inversion and eversion of the ankle is assessed in this view as either a varus or valgus alignment of the ankle joint compared to the alignment of the tibia. Lateral view: This view provides the best assessment for postural sway of the patient. Both the gastrocnemius and the tibialis anterior can be observed to assure that they fire properly to keep the patient upright. Non-weightbearing – supine: In this position, the resting state of the ankle joint is assessed. Most patients display an external rotation of the foot with the toes pointed superiorly and laterally. The therapist also observes for any deformities such as calluses, scars, and sinuses or pressure sores on the soles of the feet as well as swelling which is more prominent on the dorsum of the foot. Swelling, loss of integrity of the syndesmosis, or a malleolar fracture is indicative of Keen’s Sign – abnormal width of one ankle in relation to the other. Non-weightbearing – prone: The same observations made with non-weightbearing in supine can be made in this position as well. If the patient presents with numbness or tingling in the lower extremities a full neurological examination should be performed. The full exam includes testing of the dermatomes, myotomes, and reflexes of the lower extremity. During this part of the examination the therapist should palpate the patient’s ankle on both sides to check for any abnormalities or asymmetries such as swelling, redness, temperature, and texture and integrity of skin. Any swelling, redness, bruising, or increased temperature of the ankle joint could indicate recent trauma to the joint and could be associated with an ankle sprain, fracture, or active infection. If swelling is observed in the ankle, the Figure-8 method2 described below should be used to objectively measure the difference between ankles. Both ankles should be palpated and assessed for comparison. Anterior and anteromedial aspect: The patient should be positioned supine in order to palpate the appropriate structures. The following soft tissues should be palpated by the therapist to assess for integrity and tenderness of the structure: the muscle tendons of the tibialis posterior, flexor digitorum longus, and flexor hallucis longus, the flexor retinaculum, and the deltoid ligament complex (anterior tibiotalar, tibionavicular, tibiocalcaneal, and posterior tibiotalar ligaments). The following bones should also be palpated: the medial malleolus, the head of the talus, and the distal tibia. Anterior and anterolateral aspect: As with the previous palpations, the patient is positioned in the same way – supine. The following soft tissues should be palpated by the therapist as done previously to assess for structure integrity and tenderness: the muscle tendons of the fibularis longus and brevis, fibularis tertius, and extensor digitorum longus, the superior and inferior fibular retinaculum, the extensor retinaculum, and the lateral ankle ligaments (posterior talofibular, anterior talofibular, and calcaneofibular ligaments).The following bones should also be palpated: the lateral malleolus, the calcaneus, the inferior tibiofibular joint, and the distal tibia. Posterior aspect: For the following palpations, the patient is positioned prone with both feet off the edge of the examination table. The therapist should palpate the following structures: the calcaneus, the Achilles tendon, and the muscles of the posterior compartment of the lower leg. In addition to the above mentioned observations, the therapist should assess for any thickening or crepitus during movements of the Achilles tendon to help rule out any other existing pathologies. To assess swelling of the ankle:2 To perform the Figure-8 maneuver of the ankle, the patient should be comfortably positioned supine with the ankle off the edge of the table. The tape measure should start distal to the lateral malleolus and cross medially over the dorsum of the foot, to fall just distal to the navicular tuberosity. Then it should wrap around the sole of the foot, under the medial arch towards the proximal aspect of the head of the 5th metatarsal. From here, the tape measure is drawn across the dorsum of the foot and the anterior tibialis tendon to the distal aspect of the medial malleolus. Finally, this is wrapped around the Achilles tendon back to the lateral malleolus where the measurement started. The measurement can be taken in inches or centimeters as long as the physical therapist is consistent with what measurement is used. Again, this should be done on both ankles in order to assess a difference and to provide a benchmark for the therapist to work towards in eliminating swelling in the injured joint. It is important to assess the joints above and below the believed pathological joint to assure that the pain the patient is experiencing is not being referred from another joint. In the case of the ankle, only one major joint can be cleared – the knee. Clearing the knee: In order to clear the knee, the patient should be positioned supine. First, the examiner passively flexes the patient’s hip to 90o. The therapist stabilizes the femur with one hand while the other hand grasps the patient’s ankle. The knee is then passively flexed by the therapist until an end point is felt. After this maneuver the patient’s leg is then positioned flat on the examination table. The therapist places the palm of one hand on the patient’s tibial tuberosity and grasps the posterior aspect of the patient’s ankle with the other hand. From this position, the therapist then passively extends the knee by stabilizing the tibial tuberosity and applying a posterior to anterior force on the ankle (towards the ceiling). If the patient complains of pain with any of these maneuvers and it is “their pain” also known as the comparable sign, then further examination of the joint is warranted. If the patient has no complaints then it is safe to assume that the problem is not coming from the knee. The true ankle joint provides for two measurable motions: dorsiflexion and plantarflexion. Inversion and eversion are motions that do not truly occur only at the ankle joint. However, when examining the ankle, both inversion and eversion should be assessed. Both active and passive range of motion (AROM and PROM) should be assessed at the ankle joint for the purposes of the objective examination. Each gives the physical therapist added insight into the pathology that may be present in the joint. For example, a patient lacking AROM in ankle dorsiflexion while displaying full PROM in the same movement is most likely due to decreased strength in the tibialis anterior. In addition, a patient lacking in both AROM and PROM in ankle dorsiflexion or ankle plantarflexion is most likely due to tight plantarflexors and tight dorsiflexors respectively. 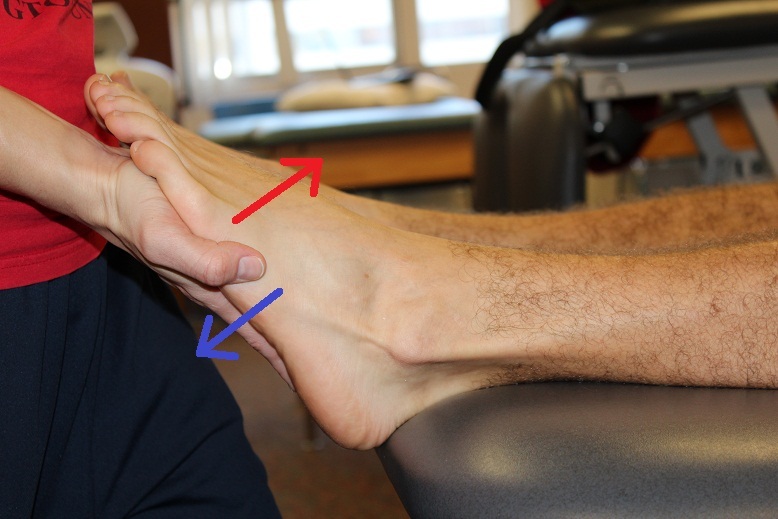 *In the following pictures the red arrows denote the physical therapist's direction of resistance while the blue arrows denote the patient's opposition to the applied resistance. Instructions typically given to the patient by the therapist are "hold, don't let me move you." To test the strength of the dorsiflexors: The patient is asked to bring the feet towards their head and the therapist applies resistance in the direction of plantarflexion with the arms crossed. To test the strength of the plantarflexors: The patient is asked to point the feet towards the ground and the therapist applies resistance in the direction of dorsiflexion. To test the strength of the invertors: The patient is asked to turn the feet towards each other while the therapist applies resistance in the direction of eversion. To test the strength of the evertors: The patient is asked to turn the feet out while the therapist applies resistance in the direction of inversion. Thompson’s Test:2 This test is used to assess for an Achilles tendon rupture. The patient is prone with the knee passively flexed to 90o. The therapist then squeezes the middle 1/3 of the posterior compartment of the lower leg. Plantarflexion of the foot should occur and would indicate a negative test. A positive test is a failure of the foot to plantarflex and indicates damage to the Achilles tendon. Homan’s Sign:2 This test is used to assess for a deep vein thrombosis (DVT) in the lower leg. The patient lies supine while the therapist passively dorsiflexes the foot and squeezes the posterior compartment of the lower leg. A positive test is determined if sudden pain is experienced by the patient. CAUTION: This test should not be performed on a patient displaying signs of a suspected DVT (swelling, redness, or warmth of skin) as this maneuver can dislodge the clot causing a pulmonary embolism. Anterior Drawer Test:2 This test is used to assess the anterior talofibular ligament. The patient lies supine and the therapist stabilizes the distal tibia and fibula with one hand. With the other hand, the therapist grasps the posterior aspect of the calcaneus and talus and translates it anteriorly on the distal tibia and fibula. A positive test is indicated if there is excessive movement compared to the other side and indicates damage to the lateral ankle ligament complex common in lateral ankle sprains. Inversion Stress Test: This test is used to assess the integrity of the anterior talofibular ligament as well as the other two lateral ankle ligaments: the posterior talofibular and the calcaneofibular ligament. The patient is put into a non-weight bearing position, either short sitting or prone. The knee is passively flexed to 90o and the therapist grasps the calcaneus with one hand and stabilizes the distal tibia and fibula. The therapist then applies an inversion stress to the calcaneus. A positive test is indicated if there is excessive movement and gapping of the joint space compared to the other side and indicates damage to the lateral ankle ligament complex common in lateral ankle sprains. As previously mentioned the true ankle joint, the talocrural joint, allows for physiologic motion in dorsiflexion and plantarflexion. Inversion and eversion can also be assessed when performing an ankle evaluation, although these motions are not true talocrural joint motion. These motions are assessed by the therapist in order to assess the movement of the ankle and can be used as a treatment technique to regain range of motion in the ankle. When performing these motions as a form of treatment, mainly grades III and IV are used. Dorsiflexion: The patient is positioned prone with the knee passively flexed to 90o. The therapist then grasps the ankle with both hands and moves the ankle into dorsiflexion. Plantarflexion: The patient is positioned the same as above - prone with the knee passively flexed to 90o. Again, the therapist grasps the ankle with both hands and moves the ankle into plantarflexion. Inversion: Patient is positioned prone with the knee passively flexed to 90o. The therapist grasps the ankle with both hands and flicks the ankle into inversion (towards the therapist). Eversion: Patient is again positioned prone with the knee passively flexed to 90o. The therapist grasps the ankle with both hands and flicks the ankle into eversion (away from the therapist). *In the following pictures the red arrows denote the direction of the force the physical therapist applies to the joint. Inferior Tibiofibular Joint: Motions assessed at this joint are AP and PA glides. AP glide:5 This motion can be assessed with the patient side-lying or supine. In side-lying, the patient is positioned so that the ankle to be assessed is up and a towel is placed under the ankle for support. The therapist uses both thumbs to provide an anterior to posterior force to the fibula. In supine, the therapist again uses both thumbs to provide an anterior to posterior force to the fibula. PA glide:5 This motion can be assessed in either side-lying or prone. In side-lying, the patient is positioned so that the ankle to be assessed is up and a towel is placed under the ankle for support. The therapist uses both thumbs and provides a posterior to anterior force on the fibula. In prone, the patient is positioned so that the ankles are off the edge of the table. A towel roll can be placed under the ankle for support. The therapist again uses both thumbs to provide a posterior to anterior force to the fibula. Talocrural Joint: Motions assessed at this joint are distraction, AP and PA glides. Distraction:5 For this motion the patient is positioned prone with the knee passively flexed to 90o. The therapist stabilizes the distal tibia and fibula with one hand and grasps the anterior aspect of the talus with the other hand. With the elbows out, a caudad force is applied to the talus. AP glide:5 The patient is positioned prone with the knee passively flexed to 90o. The therapist stabilizes the posterior aspect of the distal tibia and fibula with one hand and grasps the anterior aspect of the talus with the other hand. With the elbows out, an anterior to posterior force is applied to the talus. This accessory motion can also be done standing with the involved foot on the examination table. The patient actively dorsiflexes the foot while the therapist provides the force of an anterior posterior movement. This accessory motion can be used to enhance ankle dorsiflexion. PA glide:5 The patient is positioned the same way as in an AP glide - prone with the knee passively flexed to 90o. The therapist stabilizes the anterior aspect of the distal tibia and fibula with one hand and grasps the posterior aspect of the talus with the other hand. With the elbows out, a posterior to anterior force is applied to the talus. This accessory motion can be used to enhance ankle plantarflexion. 1. Magee DJ. Lower leg, ankle, and foot. In: Orthopedic physical assessment. Missouri: Saunders Elsevier; 2008:844-939. 2. Gulick D. Ankle & foot. In: Ortho notes. 2nd ed. Philadelphia: F.A. Davis Company; 2009:221-247. 3. Reese NB, Bandy WD. Joint range of motion and muscle length testing. 2nd ed. Missouri: Saunders Elsevier; 2012. 4. Hislop HJ, Montgomery J. 8th ed. Missouri: Saunders Elsevier; 2007. 5. Maitland GD. The ankle and foot complex. In: Hengeveld E, Banks K, eds. Maitland's peripheral manipulation. 4th ed. Elsevier; 2005:525-575.